Premier LED Fibre Optic Father Christmas Canvas illuminated with 4 LEDs is suitable to be wall hung or placed on a mantle-piece. 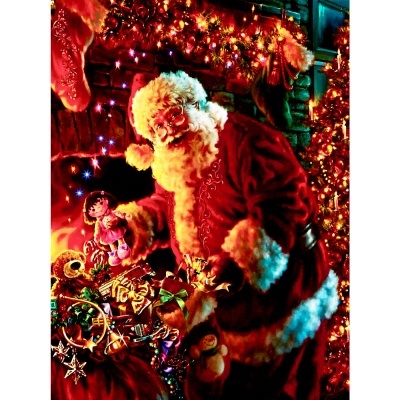 Enjoyed as a delightful Christmas themed centrepiece, this decoration wall canvas offers something very homely. Battery operated for ease of placement, requiring no mains wiring or cables to be located. Low energy LEDs ensure battery life is maintained so battery changing is unlikely during a single season of use. Canvas can be easily switched On/Off from switch placed on canvas side ensuring canvas removal from wall is not required. Consealed battery compartment on reverse.